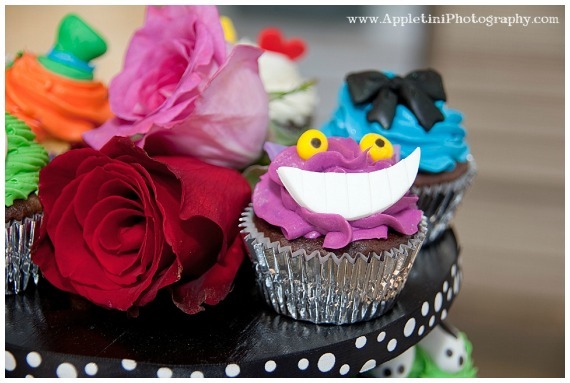 This Alice in Wonderland party submitted by Heather from Appletini Photography & Design is quirky to the core. The attention to detail is outstanding and you would be forgiven for thinking you had literally stepped into Wonderland. With the Queen of Hearts Royal Court as the setting, everything you could think of was included in this party. 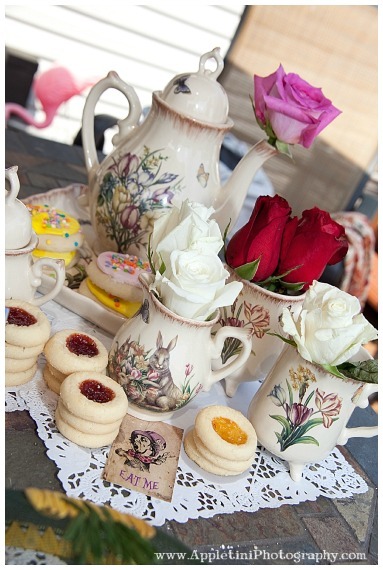 All the tiny details were thought of ranging from the Mad Hatter to card guards, flamingo’s and gorgeous tea cups for the tea party. 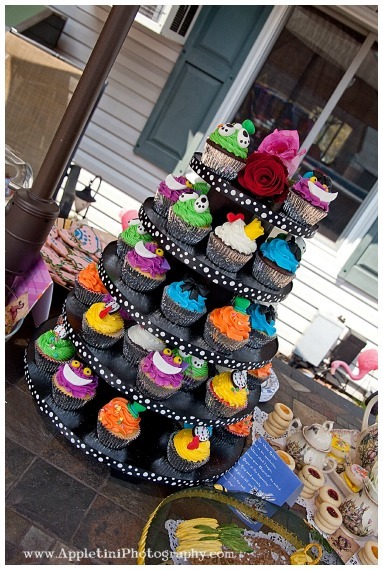 If you are looking for something a little crazy and fun, then an Alice in Wonderland party is for you! 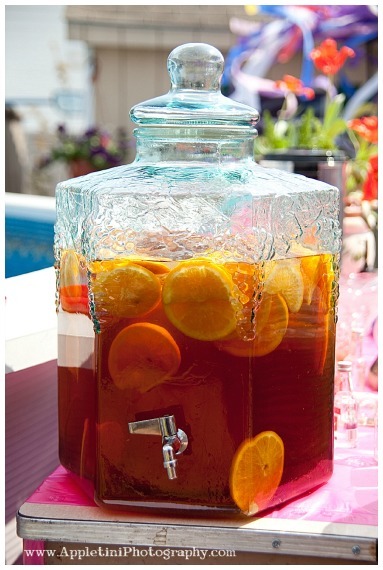 This party was designed for a bridal shower, but could easily be incorporated into a party for any occasion. 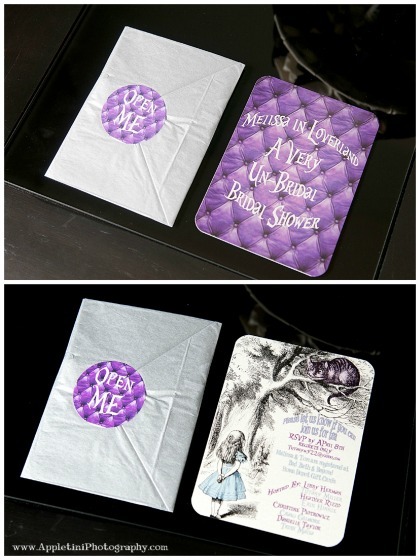 The invitation format you choose should reflect the overall theme of the party. This is important not only for giving your guests an idea of what to expect at the party, but it will also raise their excitement and make sure that they clear their calender to attend it! 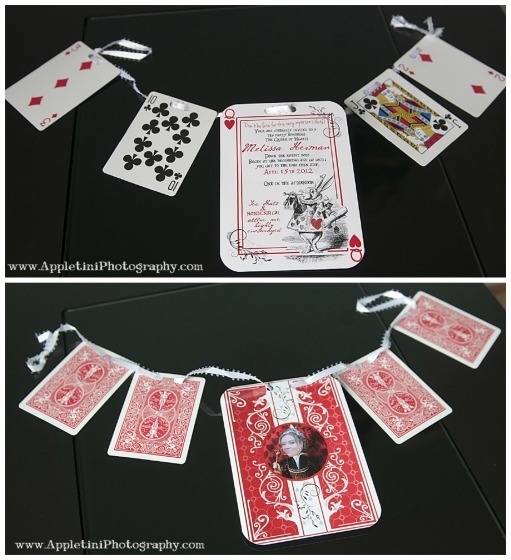 These invitations were created and printed by Appletini Design and set the stage for the party beautifully. 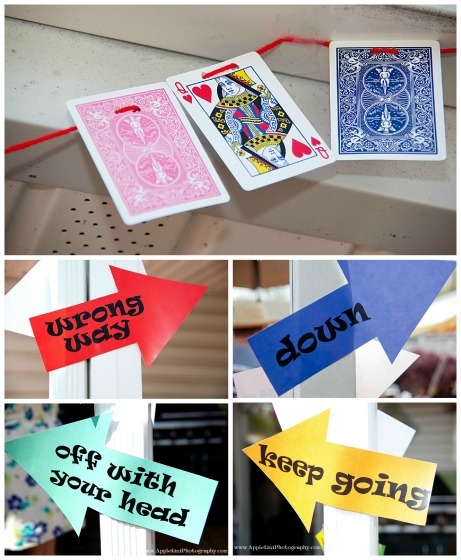 The party decoration is where you can let your creative flare go wild and an Alice in Wonderland party is perfect for creativity! There are so many different things you can incorporate and Heather and the rest of the bridal party definitely made the most of every opportunity! 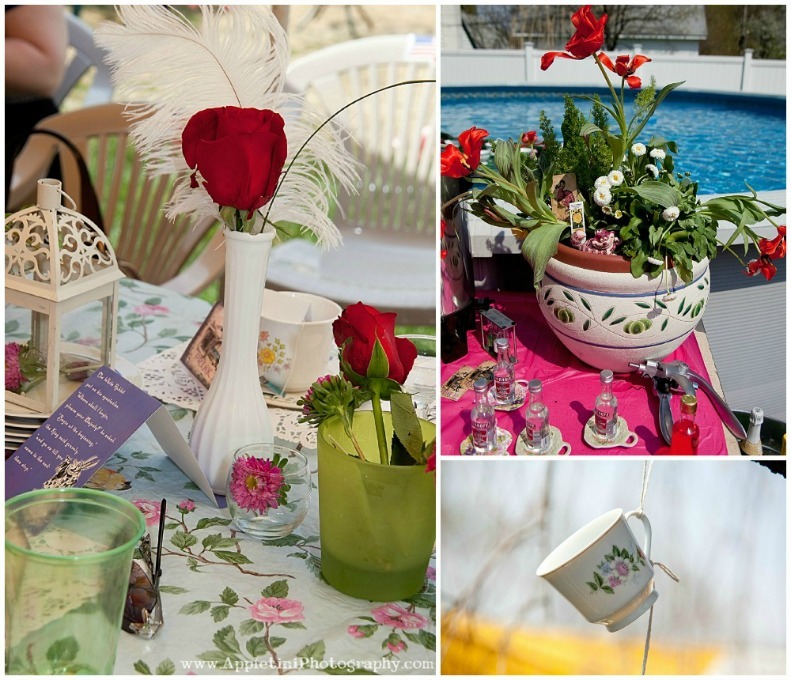 Heather said “We rented a tent and set up formal tables decorated with vases, flowers, lanterns, signs, and feathers. 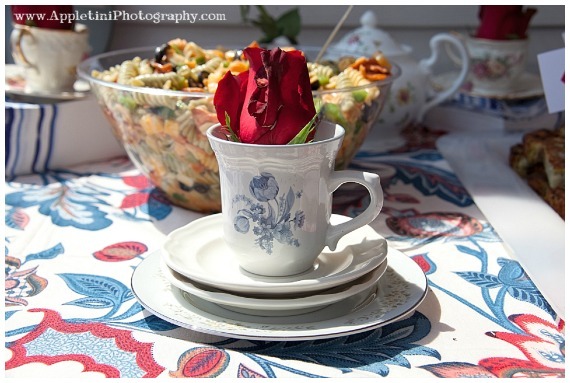 Each guest had their own place setting complete with a lace place mat, toasting glass, game board, and a teacup and teabag favor. 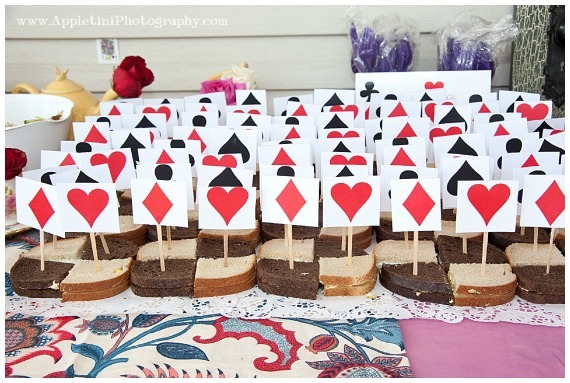 The yard was turned into the Queen of Hearts Royal Court and everything needed to be decorated. 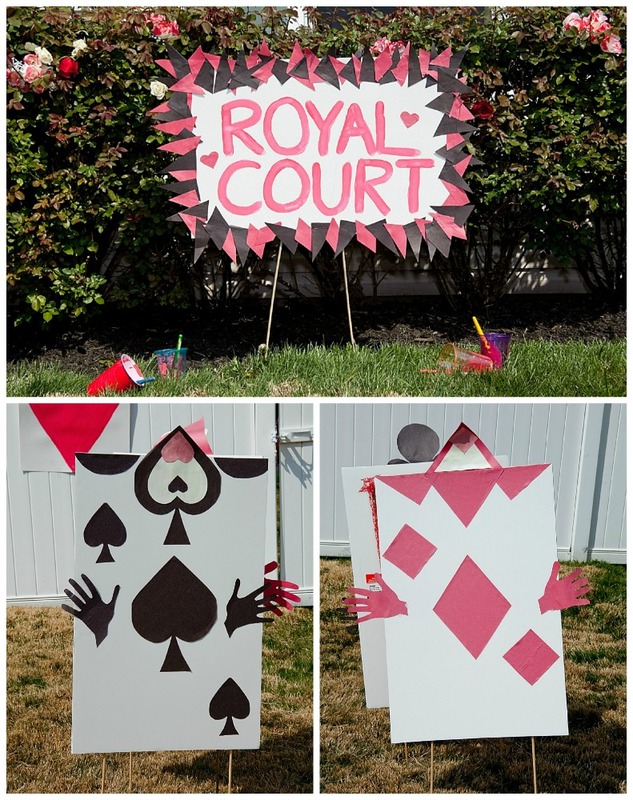 Card Guards were made out of sturdy poster board and construction paper, and stood in the ground with wooden dowels. We painted suits on poster board to deck the fence. 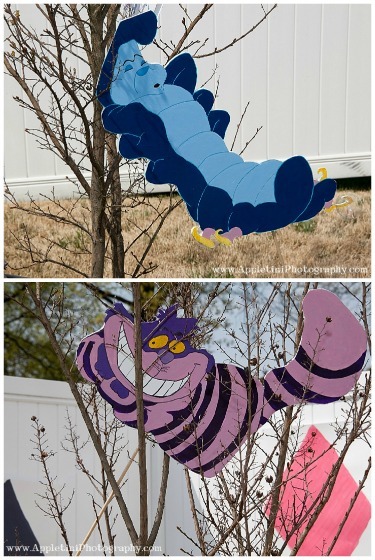 The Cheshire Cat was the bride to be’s favourite, so he was drawn on poster board along with the White Rabbit and the Hookah Smoking Caterpillar and displayed around the party. 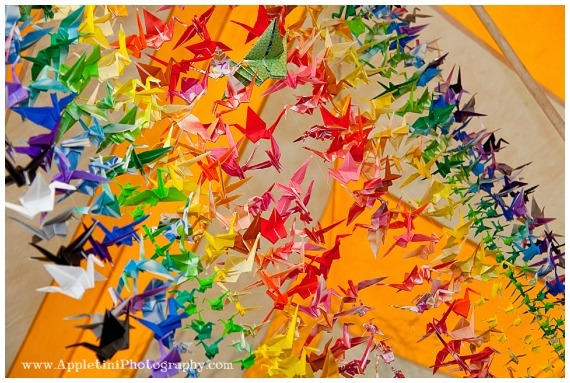 There were so many DIY projects but the one we took the most pride in were the 1001 paper cranes evolved out of Japanese legend. 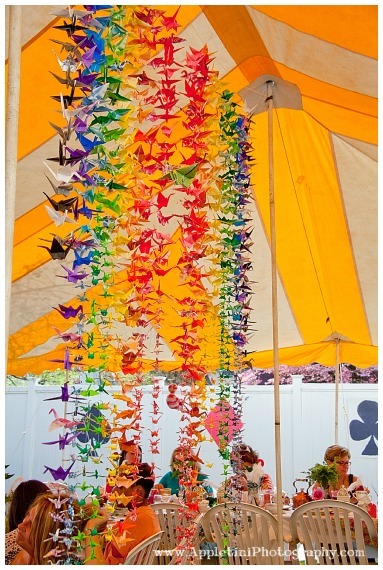 Cranes were thought to live a long life and the construction of 1,001 paper cranes for the bride & groom symbolized good fortune, fidelity and longevity. The bridal party folded for weeks before the event and they hung proudly as the tent’s centerpiece. The bride to be was touched by the gesture which made every fold and paper cut worth it! They really did look phenomenal! The bride and groom even used them as décor during their cocktail hour. 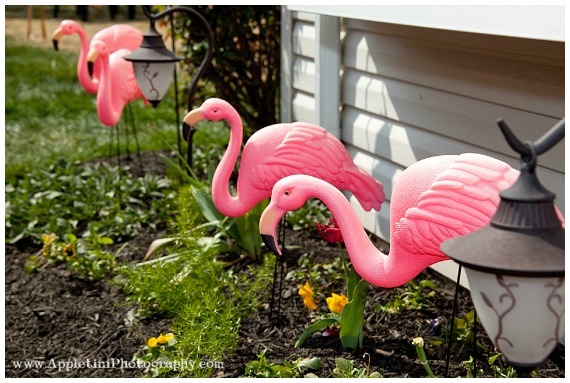 Finally, Flamingos and a croquet game were set up in the side yard along with a hookah station with flavored tobacco and lots of laughs in this corner of the yard. 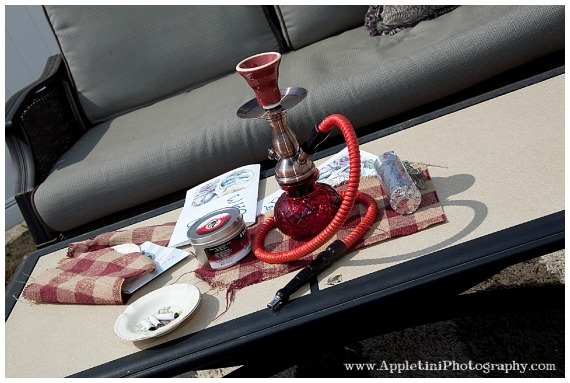 The hookah was then gifted to the couple. 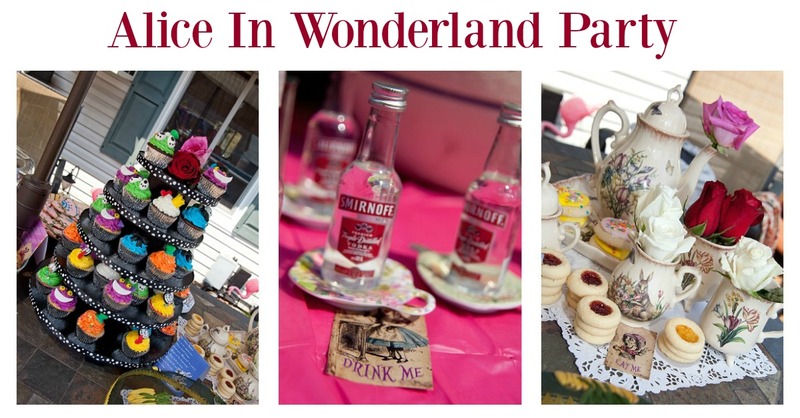 It is not always possible for food to specifically follow the theme of a party, but an Alice in Wonderland party allows for all the delights of a yummy tea party. Having some fun party games will enable your guests to interact and let their hair down a little. Quite often people who you don’t think will get involved will end up enjoying party games, as long as you put a little bit of thought into them. 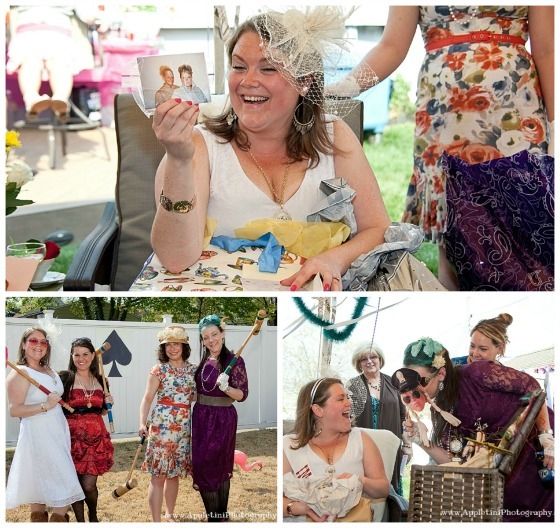 This Alice in Wonderland party was held for a bridal shower, so party games were a must. Heather thought of some fantastic ideas which she has shared. 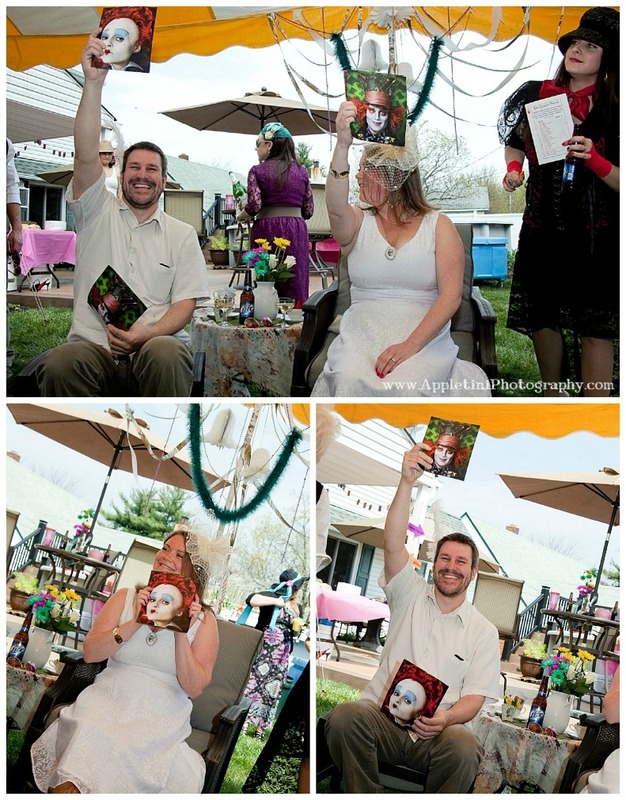 Heather said “The groom brought the bride to be and stayed to play an “Alice” version of The Newlywed Game. We gave them each a Mad Hatter picture and one of the Queen of Hearts. We asked them questions, such as “Which of you are more likely to run late?” They would hold up the Mad Hatter for the groom and the Queen for the bride. It was funny to see their answers but even funnier when they didn’t match! Before we played each guest had a list of the questions we were going to ask and were asked to guess who they thought would answer what. The winner was the one with the most matches. We played another game while we were opening gifts which worked out perfectly. On the other side of the game board was a list of funny captions. We passed 20 numbered pictures of the bride around in zip locks and had our guest match them up with the captions. It was pretty hysterical! We also had a photo booth. The bride is famous for photo-bombing, her silly photo poses but mostly her funny faces. 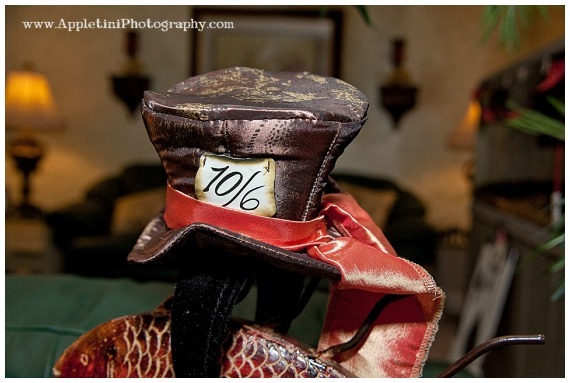 For photo booth props we used Wonderland themed props along with “the many faces of the bride” on sticks. They were sooo funny and are still making random appearances. 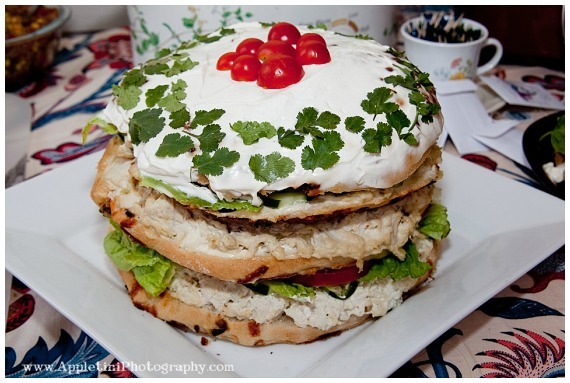 Do you have a quirky nature that would suit this party theme? Or perhaps you have held something similar? Let me know what you think and if you like this article, please SHARE and PIN it. 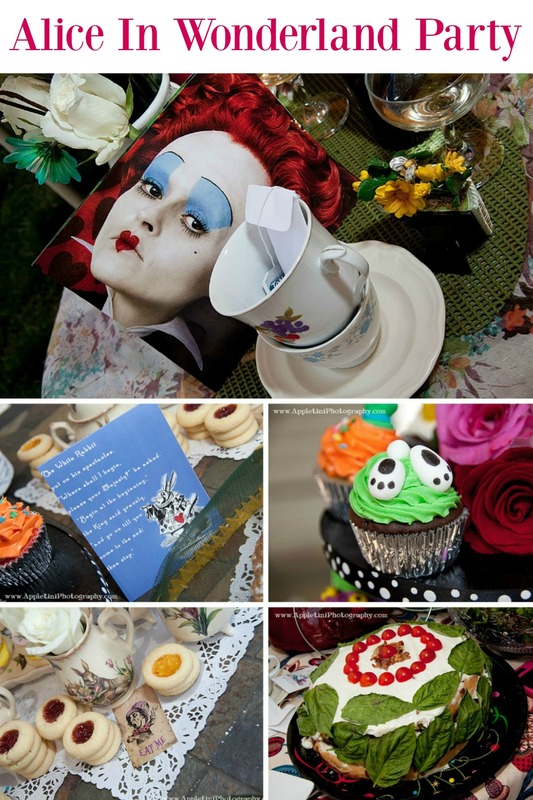 Planning your own Alice in Wonderland Party? 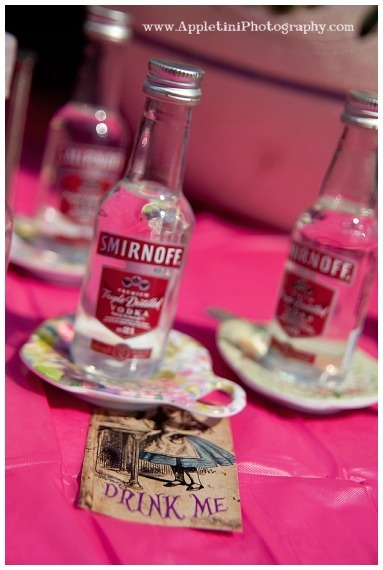 Check out these party supplies to help set the scene…. Oh how exciting Suz…..I would love to see the finished party 🙂 It’s such a fun party theme, one that kids and adults can enjoy together too. 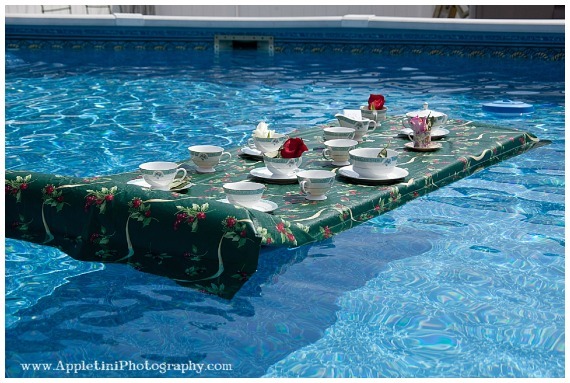 The floating tea table is just GENIUS. And so SO pretty! Love it.